We try to organise several weekend sails and two week-long sail-cruises (one around the UK and one in a sunnier climate) each year. 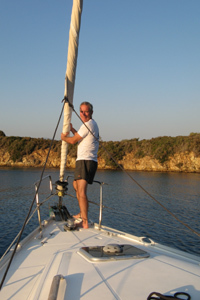 Sailing-cruising has a relaxed atmosphere most of the time. Mostly, we charter 11-13 metre yachts with 6-8 berths, onboard toilets ("heads" in nautical terminology) and cooking facilities. Yachts have been referred to as "caravans on water"! Despite this description they can provide some wonderful experiences; the dawn over a distant coast, dolphins playing with your wake etc. The ocean sailors regularly see whales but we don't go that far out to sea! We balance the calm and isolation of anchoring in a deserted bay with the more social mooring in a marina and going ashore for a drink or two. We have Yachtmasters, Coastal Skippers and Day Skippers to draw from and there are lots of experienced sailing crew. Novice sailors are welcome whether you simply want to get a taste of what sailing is like or you want to gain more experience. For the latter we can, if you want, provide an experience similar to what you would find on a RYA sailing skills course although we must stress that we are not an accredited centre and would always recommend that you should undertake official training at one. Our emphasis is on safety, fun and learning. On the sunnier climate sailing cruises comfort takes a high priority too. We try to balance our trips between the warm climate, "floaty, boaty" sailing trips and more challenging sailing in less clement weather. 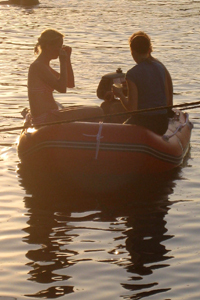 We also have some weekend trips where the emphasis is on sailing skills. 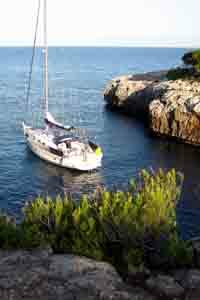 In the last years we have sailed from Portsmouth to Falmouth on the South Coast and from Alcudia in Mallorca. 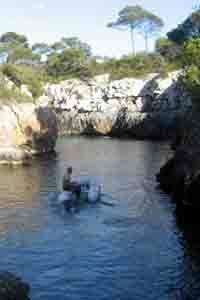 Our destinations have included the Scilly Isles, the Channel Islands, Ireland, Cherbourg, Scotland, Croatia, Turkey, Corfu and Menorca. Suggestions for future destinations are welcome.